The word “tricycle” often brings up memories of racing up and down your driveway or footpath in your early childhood, but the tricycle or as it is now commonly known, the “Trike” style of bicycle is having a huge comeback as a popular form of transport, recreation and exercise all over the world. Adult Trikes are becoming more and more popular among a whole range of ages. For seniors, Trikes offer a great biking experience without the impact on their bodies, they have much better stability than two-wheel bicycles and can support a heavier or wider load. Many riders who are unable to use a traditional narrow bicycle seat including elderly riders or those with disabilities are more comfortable in an upright Trike seat, since these seats are significantly wider and more padded. Teens love the ‘coolness’ of owning and riding a Trike and heavy schoolbags can be carried in the basket rather than putting additional pressures on a growing body. The ability to carry a wide range of luggage from your weekly shopping, your surfboard, your dogs or just about anything you can think of makes Trikes ideal for getting around and when you are ready to park your Trike you simply set the handbrake and get off, the Trike does not need a side stand or anything else to support it from falling over. Companies are buying Trikes for personnel and goods transport around the premises. Other people just love the nostalgic look and fun design and most importantly it’s a great, fun way to keep fit. Whilst these new Trikes are relatively new to Australia they do have a long and rich history that very few people know about. Records tell us that the first Trike was built in Germany in the year 1680. Designed for a paraplegic by the name of Stephan Farffler, this special Trike was operated by gears and hand cranks, granting the gentleman a new form of mobility and freedom. 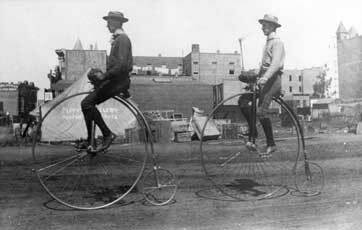 Two gentlemen ride penny-farthings in Los Angeles, 1886. 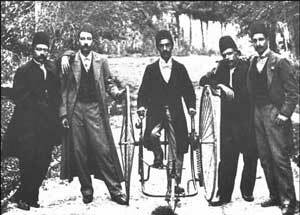 Another form of tricycle was invented by two Frenchman, Blanchard and Maguire; the vehicle gaining enough popularity amongst the people, that the “Journal de Paris” created the terms ‘bicycle’ and ‘tricycle’ in order to differentiate between the two and three-wheeled varieties. 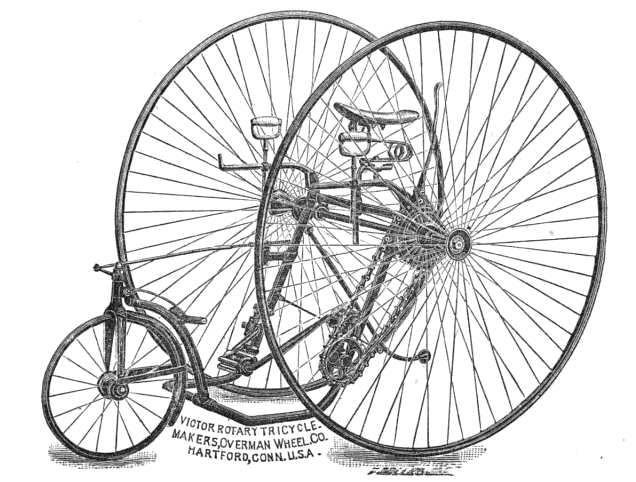 By 1876, the tricycle craze began to sweep through England, but it’s not the tricycle we are familiar with today, Charles Amey’s Coventry tricycle had two small wheels on one side and a large wheel on the opposite side. While somewhat awkward to control, Amey’s Trike was very popular amongst the ladies, allowing them to easily get on and off the tricycles without the dreadful risk of showing their legs in public. 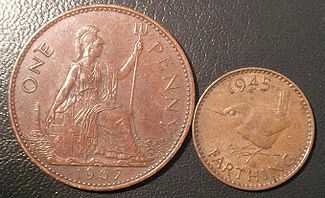 The tricycle was also more convenient for people of shorter stature; the bicycles of the time raised high up into the air, with almost comically large wheels and were commonly known as Penny-farthings. For this reason, there would be more than 100 different models of tricycles, produced by 20 different manufacturers in England, by the year 1884. For the next 5 years, tricycles would maintain their popularity lead over bicycles, but times were changing. Bicycle styles altered, becoming easier to ride and more pleasing to the eye, slowly taking over the lead in sales. While the tricycle remained a popular mode of transportation amongst the working class, the more expensive and flashier-looking bicycles seemed created for the gentry; those who could afford to purchase frivolities for simple, recreational use. Through the years, tricycle popularity would slowly decline throughout Europe and, by the 1990’s, very few tricycle manufacturers would remain in England. In more recent years, the tricycle has made a comeback, especially in the United States, Australia and New Zealand. Originally gaining popularity amongst the elderly, where Trikes offered a new form of mobility, the popularity of tricycles has spread into many households and retirement villages across the nation. Modern Trikes, equipped with a small basket in the front and a large basket behind the seat, provide an ideal means of transporting groceries and other items, when one is energy-conscious or for those who don’t own an automobile. For the teens the Trike has increased in popularity as a cool way to go down-town or to the beach carrying your surfboard, boogie board and fins in the back basket and on school days the Trike is a great way to carry your heavy schoolbooks and sporting equipment. Tricycles offer a wonderful form of transportation to a wide variety of people throughout the world. One should always remember however, that safety still applies! While the tricycle tends to be slightly heavier and far more stable than its two-wheeled cousin, this is no excuse for not wearing a helmet. A great many injuries could be prevented, each year, if people would only wear the proper safety equipment. Also important is remembering that tricycles must obey the same safety rules as bicycles. Anyone riding a Trike should always obey traffic laws, use hand signals and, if you are riding after dark, ensure that your Trike is well marked with reflectors and a headlight. Wearing light colors, while riding a Bike at night, is also essential; just as it is a motorist’s job to look out for cyclists, so it is the cyclist’s job to ensure that they make themselves as visible as possible to motorists.